Tofu seems to be a dark art - people either “get it” or they don’t. For newbies to tofu, Monica suggests starting with tofu scramble. It’s a super simple, versatile and fast way to prepare tofu that’s really hard to get wrong and makes a great vegan breakfast. I think more people would ”get” tofu if they knew how to reliably prepare it in a way that makes it taste good. I’ve heard many horror stories of people trying to use tofu and complaining that it was “gloopy”, “flavourless” or “gelatinous”. If this happens, you’ve either got a really bad batch of tofu (rare) , are using the wrong kind of tofu (silken vs firm) or simply didn’t prepare it well (the likely culprit). For newbies to tofu, I suggest starting with tofu scramble. It’s a super simple, versatile and fast way to prepare tofu that’s really hard to get wrong. It’s also a one-pan meal, making for easy clean-up and a great option if your dining solo. It’s one of my favourite healthy vegan breakfasts, but don’t let the “scramble” fool you into thinking this is only for breakfast: it’s great for a quick vegan lunch or dinner, too. The scrambled tofu premise is simple: fry an onion, because as we know, a good fried onion is the start of all good things. Add your vegetables, some crumbled tofu and some seasoning. Cook until its done, and boom, you have scrambled tofu, ready to be served with whatever you want: toast, tortilla, fried potatoes, whatever you’d like. My favourite accoutrements are avocado and toasted pumpkin seeds. The reason scrambled tofu is fail-safe is because you can basically cook the tofu in the pan until it’s as “wet” or as “dry” as you’d like, achieving the texture you desire. I like to cook mine so it gives up a lot of its liquid and is on the dry side, but sometimes a “wetter” scramble is called for. And because the tofu is crumbled into small bits, it easily picks up on all the flavours of the onion and seasonings around it. As to the vegetables and seasonings, I like to work with what’s in season. In the summer, I love to combine courgettes, sweetcorn, broccoli and tomato, along with fresh herbs like parsley and basil. Autumn brings cabbage and Brussels sprouts, terrific in a tofu scramble with caraway seeds. 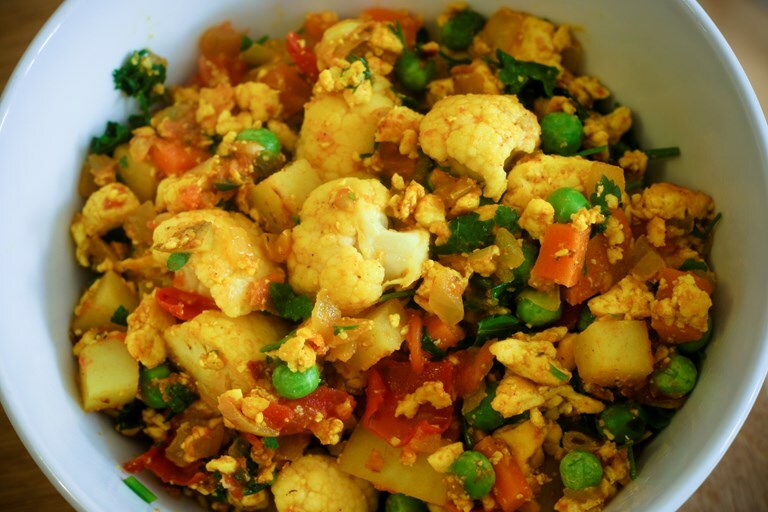 For an Indian twist, I like cauliflower, peas and tomato with curry powder (serve with chapatti and mango chutney). Here’s my basic recipe for tofu scramble which you can adapt as you’d like with whatever vegetables and seasonings you have on hand. I almost always include tomato, and add it early in the cooking so that the tofu can absorb some of the flavour from the cooked tomato, which to me adds a little something special to the mix. You’ll notice my inclusion of “nutritional yeast” in the ingredients - it’s a natural food derived from yeast, totally optional but it does add a savoury (some call it cheesy) element to the scramble. You can buy it at natural food stores. Add the soy sauce, vegetable combination of your choice and any seasoning you’re using (except fresh herbs) and cook until veggies are tender, stirring every so often. If using potato, cook the potato ahead - this is a great use for leftover roast or boiled potatoes!